Accuracy is +/-0.2 degrees C. Can also be used in combination with either the MyoScan or MyoScan-Pro sensor, which snaps to its back. Compatible with Triode electrodes or extender cables for wider placement of electrodes. Range of 0–2000 μV. 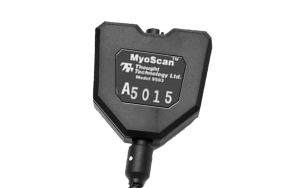 The MyoScan is a pre-amplifier of surface electromyography (sEMG). Surface EMG measures muscle activity by detecting and amplifying tiny electrical impulses generated by muscle fibers when they contract. The sensor detects and averages a complex addition of impulses from many muscle fibers within the recording area of the sensor, contracting at different moments and at different rates. The number of muscle fibers that are recruited, and the rate of firing (contraction) of each fiber, during any given contraction depends on the force required to perform the movement. Because of this, the intensity (amplitude) of the resulting electrical signal, under certain condition, is proportional to the strength of contraction. TECHNICAL SPECIFICATIONSThe Sensor Isolator has 4 inputs. These inputs can be connected to any Thought Technology sensors, such as, but not limited to, EMG, EKG or EEG sensors. sensor is designed to coexist with other Thought Technology bio potential sensors such as S????? EEG sensor, ST9305M, ST9306M EKG sensor or SA9309M Skin Conductance sensor. To ensure correct MyoScan sensor operation, if sensors from another manufacturer are in the same electrical circuit and connected to the same subject, their electrodes must function at a voltage within the specified operating bias range, 1.0 to 3.0 volts above sensor ground. To check whether another sensor is interfering with the MyoScan sensor operation, connect and disconnect the other sensor from the subject, and note whether this causes a change in the MyoScan sensor signal level, or whether connection of the other sensor appears to cause any signal artifacts in the EMG signal. On some data acquisition systems, using differential input mode, and oversampling followed by digital low pass filtering, can be helpful to reduce noise levels. The TT Sensor Isolator 4∞ (ST9405AM) is an interface device providing electrical isolation at a level of 4kV, equivalent to two Means of Patient Protection under IEC 60601-1. It provides a battery powered regulated 7.26 volt supply to connected sensors, and allows Thought Technology sensors to be safely interfaced with analog inputs of line-powered systems, such as computers with DAQ cards. Note that this device isolates only between sensors and the DAQ interface, not between different sensor channels. For more detailed information on the Sensor Isolator 4∞, consult the Thought Technology website or contact the sales department or your distributor. WARNING: Thought Technology cannot guarantee that user setups connecting Thought Technology sensors (or preamplifiers) to non-Thought Technology devices are electrically safe for patient connection. In particular, if a patient-connected sensor is connected to any line powered device, an elevated risk of electrical shock may be present, unless all devices to which the sensor is electrically connected implement medical grade patient isolation from any power supply mains. CAUTION: Connection of customer supplied circuits to Thought Technology sensor products has the potential to damage the sensor. Such damage is not covered by warranty. The sensor cable contains 4 color coded conductors. The following table shows the color coding and connector pin assignment. To make interfacing cables for custom set-ups, a single sensor cable may be cut in half. Both sides may then be used by stripping the outer insulation of each required conductor. The nominal supply voltage for this sensor is 7.26V. The sensor can safely be used with a supply voltage of up to 9V. However, as the sensor is calibrated with a 7.26V supply voltage level, changes in gain and offset may be expected when operating at a different supply voltage. Proper skin preparation is important to get a good signal and minimize artifacts. Before applying electrodes, make sure the skin surface is clean and dry. Abrade the skin with an abrasive cream, such as NuPrep (10-30), to remove dead skin. Alternatively, you can also clean the skin with an alcohol swipe and let it dry, but this is not as efficient as the abrasive cream. If necessary, shave excess body hair. The electrodes are either directly connected to (or “snapped onto”) the sensor, or indirectly connected via an extender cable, often a solution for smaller muscle. If you use single electrodes with an extender cable, snap the electrodes onto the cable connectors before applying them to the client. Once the electrodes are positioned on the skin, the action of applying the cables may be more difficult or may be uncomfortable for the client. First, place the active electrodes (blue and yellow) on the examinee. The active electrodes should be placed in line with the muscle fibers, unless specified otherwise. Then place the reference electrode (black connector) anywhere on the body. A bony area with minimal muscle coverage is a good choice. Make sure the electrodes are placed firmly on the skin, and that there is good contact between the skin and electrodes. Putting a small amount of conductive electrode paste or cream, such as Ten20 (10-20-4T on the center of the electrodes (grey area only) before applying them to the skin may further improve the signal. Table below lists Thought Technology accessories for the TT MyoScan. T3402M – Triode electrode (single use): The Triode should be your first choice. It can be snapped directly onto the sensor head, which makes it very easy to use and quick to position. The signal is then amplified right over the muscle site, which dramatically increases the SNR (Signal-to-Noise Ratio) and limits contamination of the SEMG signal from surrounding electromagnetic fields and from movement artifacts generated by wires being pulled. T3425 – UniGel electrodes (single use): UniGel electrodes provide complete placement freedom. Their small size allows placement on very tiny muscles (such as SCM). Since they are not attached together, they may adhere better at sites where the skin undergoes great deformation while underlying muscles contract. UniGel electrodes are also pre-gelled thus do not require the addition of conductive gel, which can reduce preparation time. An EMG Extender Cable (T8720M) connects these electrodes to the sensor. SA2306 – EMG Headband (single client re-use): The EMG Headband enables easy EMG measurement from the forehead (frontalis), which is a common EMG placement for stress/relaxation biofeedback. The headband accommodates 3 snap electrodes (Ag-AgCl) that work with the EMG Extender Cable (T8720M).